AS YOUR MOTHER I PROMISE YOU THAT I WILL ALWAYS BE IN ONE OF - ProudMummy.com the Web's Community for Mums. 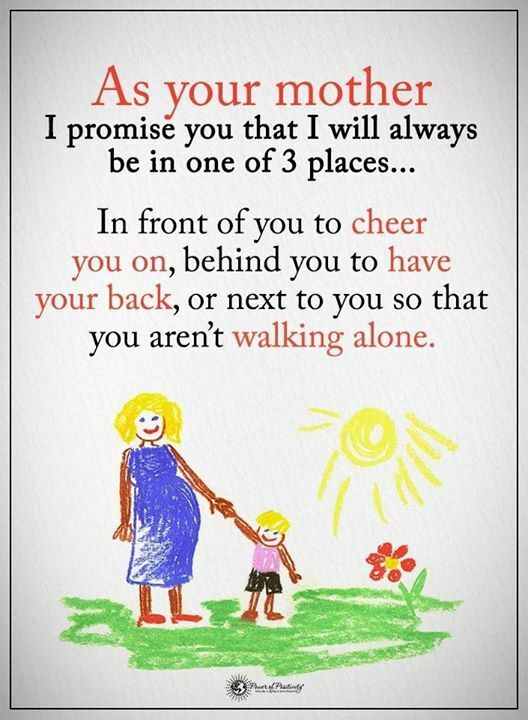 AS YOUR MOTHER I PROMISE YOU THAT I WILL ALWAYS BE IN ONE OF 3 PLACES... IN FRONT OF YOU TO CHEER YOU ON, BEHIND YOU TO HAVE YOUR BACK, OR NEXT TO YOU SO THAT YOU AREN'T WALKING ALONE. ....or in the pantry drinking wine and eating your Easter eggs/selection box. Nicole Daly This just popped up on my news feed! Good timing!! Used to think I did all of that but apparently not! As every mother should, sadly not the case in all mothers! !